In memory and honor of one very special cat, How QUACK Edward J. Nichols, DVM, Crestway Animal Clinic, San Antonio, Texas, treated Suki. Read Suki's Story. Has Your Veterinarian Sued You or Threatened to Do So? In an effort to keep the public informed, we will monitor and report on litigation by vets who sue their own clients for any reason, but most especially those filed in an attempt to silence their critics or interfere in any way with a citizen's rights under the First Amendment. If you have a story to share about vets who have filed lawsuits and/or attempting to obtain unconstitutional injunctions against former clients sharing their experiences, contact me. I was sued by Crestway Animal Clinic and Edward J. Nichols DVM for telling Suki's Story. As you can see, he failed miserably with his bully lawsuit. 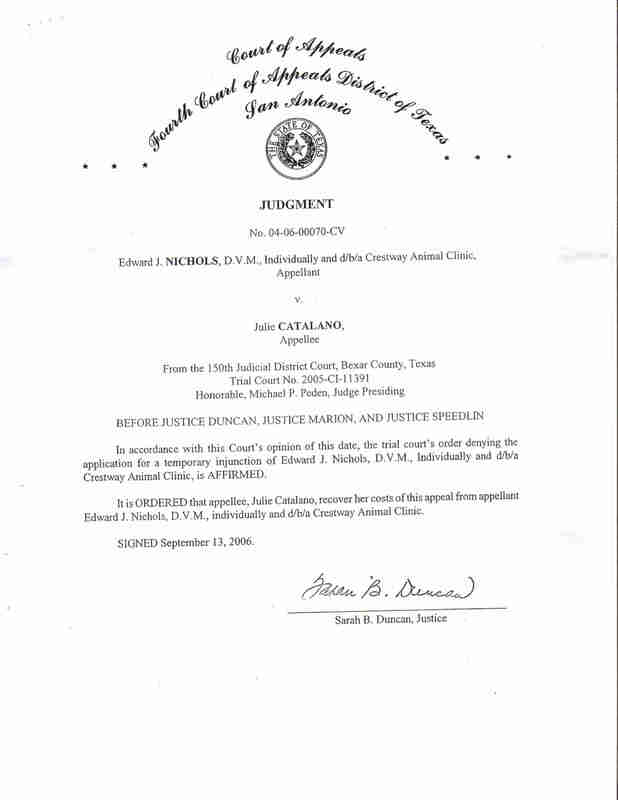 On July 21, 2005, Edward J. Nichols, DVM, Crestway Animal Clinic, San Antonio, Texas, filed a lawsuit against me, seeking a permanent injunction to dismantle vetabusenetwork.com and enjoin me from expressing my opinions about him and his treatment of Suki. How interesting that the ONLY judgment issued by ANY court ANYWHERE during this ENTIRE lawsuit was ISSUED AGAINST ED NICHOLS. Bet he's not SPREADING that little piece of news around, hmm?? After 2 1/2 years of litigation, this matter was set for trial on March 10, 2008. THIS CASE WAS DISMISSED WITH FINALITY ON MARCH 10, 2008. Nancy Deas and Edna Deas are the owners of www.aligus.com. In March 2005, they were the first ones that we know of to be sued by a veterinarian (Kevin Monce, DVM, DACVIM, North Carolina) for the comments about him on their site in conjunction with the death of their dog Alex and the handling of their complaint by the North Carolina veterinary board. After 2 1/2 years of litigation, this matter was set for trial the week of October 26, 2007. The vet withdrew his lawsuit on October 22, 2007. The case was terminated with finality on November 13, 2007. Rest in peace, Suki, Alex, and Gus. Vet leaves gauze inside dog during surgery, then threatens to sue owner for telling her story on her web site. See below, under "Michigan." Have you been sued by your former veterinarian or any other veterinarian? Please let us know and we will post the information here. Lawsuits are PUBLIC RECORD. We will help you get the word out of ANY veterinarian ANYWHERE who is filing these hideous and destructive lawsuits in an attempt to silence the truth. We are especially interested in lawsuits that have been filed against victims for filing complaints with their state veterinary boards, for speaking out at public meetings, or for testifying to legislative or government entities. These types of suits are traditionally brought by wealthy and well-connected individuals and corporations against those with few resources to legally defend themselves. The public has the right to know who these bully vets are so they can choose their vets accordingly. IF YOU ARE A TEXAS RESIDENT, YOU SHOULD KNOW THAT THE STATE RECENTLY PASSED ANTI-SLAPP LEGISLATION. IF YOU HAVE BEEN SUED BY A TEXAS VETERINARIAN IN THE PAST YEAR PLEASE CONTACT ME. January 2008. Bob Esplin, DVM and Sylvania Veterinary Hospital file a defamation counterclaim against Kelly Kaczala of south Toledo in response to her filing suit against Robert B. Esplin, DVM and Sylvania Veterinary Hospital for breach of contract, negligence, and negligent training. July, 2007. Lawsuit filed by Bernard Hecht, DVM, Tulsa, Oklahama, against Bruce Begley. No injunction served. Begley files counterclaim against Hecht for damages. November 2006 . http://bobobear.bravehost.com/ Lawsuit filed by David Faulkner, DVM, Amarillo, Texas, November 2006, against Betty Garrity. No injunction served. July, 2005. www.vetabusenetwork.com Lawsuit filed by Edward J. Nichols, DVM, and Edward J. Nichols. d.b.a. Crestway Animal Clinic, San Antonio, Texas, against Julie Catalano. Temporary restraining order and injunction served. Nichols' injunction was denied by the court. July 21, 2005 - Nichols serves Catalano with notice of temporary restraining order and petition, demanding immediate removal of all content that contains his name, the name of Crestway Animal Clinic, and all references to his treatment of Suki from the website vetabusenetwork.com. July 28, 2005 - Hearing on temporary injunction. Trial court denies Nichols' motion for temporary injunction. September 13, 2006 - Fourth Court of Appeals decision. Appeals court affirms lower court's decision - Nichols loses appeal. Judgment entered against Nichols. 2005- 2008. Ongoing lawsuit seeks to obtain permanent injunction against Catalano to dismantle vetabusenetwork.com and enjoin future speech that would prevent her from expressing opinions about Nichols, Crestway Animal Clinic, or his treatment of Suki the cat. March 10, 2008 - Case set for trial in Bexar County, Texas, District Court. STATUS: THIS CASE WAS DISMISSED WITH FINALITY ON MARCH 10, 2008. What Happened to Suki...and What Happened to Me. Read more about The Lawsuit on Suki's Safe Haven blog. March, 2005. www.aligus.com Lawsuit filed by Kevin Monce, DVM, Cary, North Carolina, against Nancy Deas and Edna Deas, Raleigh, North Carolina. No injunction served. March 2005. Monce serves Nancy Deas and Edna Deas with libel/defamation lawsuit. No temporary restraining order or injunction served. The case was been terminated with finality on November 13, 2007. Editorial: Why is the Free Speech Online Campaign Important?